AgilQuest‘s OnBoard helps employees choose when, where, and how they work. As workplaces shift to increasingly more flexible ways of working, the need for tools to measure and manage the space continues to grow. Enter AgilQuest, whose OnBoard Workplace Management System is designed to support employees in choosing when, where, and how they work each day. Intrigued? We reached out to the AgilQuest team to learn more. OnBoard allows organizations to manage hoteling, permanent/assigned seats, conference rooms, and free-address/touchdown seats all in one system. With a variety of interfaces, it is easy for employees to choose the best place for them to work at any given time, improving employee engagement and productivity. At the same time, the organizations benefit by gathering accurate occupancy and utilization data to help make decisions that make more efficient and better utilize their space. Organizations can reliably and confidently reach 2:1, 4:1, and even 6:1 worker-to-workspace ratios and reduce real estate costs and energy consumption by 50 percent. 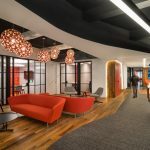 Modern workplaces have made a shift to offer more flexible options such as telework, shared space, collaboration space and touchdown spaces. Whether workspaces are assigned or reservable, an organization who can accurately measure and easily manage space can also determine what kinds of space in which their employees enjoy working the most and are most productive. OnBoard supports the choice for where employees decide to work, whether they’re just in the office for a few hours, have been assigned space near others in their department, or need a collaboration space or conference room that is in the best location and without worrying about double bookings. Can you tell a story/give an example of a client who has used the product effectively? Check out Work Design’s recent case study coverage of GSA and Booz Allen Hamilton, as well as our own case study of Customs & Border Protection. People love choice. Choice drives engagement, engagement drives productivity and productivity drives revenue both for the individual and for the organization. OnBoard resulted from the need for a system that allows everyone in the organization to search for, locate, choose, use and enjoy all workplace assets in the portfolio. On the profitability side, companies must generate profits to survive. Maintaining excess infrastructure is unhealthy. Because occupancy costs — an organization’s second largest expense — lay vacant on average over 50 percent of the time, it is a good place find opportunity for profit improvement. And finally, sustainability. For many companies, buildings generate most of greenhouse gases and consumes the lion’s share of energy. How can an asset that is being used 50 percent of the time be called sustainable? Fifty percent excess capacity means consuming 50 percent too much material, creating 50 percent excess construction waste, causing 50 percent unnecessary wastewater runoff, consuming 50 percent too much energy, and producing 50 percent more CO2 than it should. OnBoard resulted from the realization that implementing a system that measures, manages and maintains the way a building is actually occupied has orders of magnitude greater impact on sustainability than any smart building technique. The ability to easily manage all kinds of space — hoteling, permanent/assigned seats, conference rooms, and free-address/touchdown — through a number of interfaces, including web, mobile apps, digital signage (hardware agnostic). OnBoard also provides an easy way to manage visitors and know where all employees are sitting in case of emergencies. OnBoard is extremely customizable and adaptable to the needs of each business. Pricing is determined by the number of resources in the system as well as additional configurations and customizations. There is a “lite” version called OnBoard Professional that is pre-configured and better for a smaller number of resources. OnBoard will be transitioning to a SaaS-based platform later in 2017 and will have all the same functionality, with less implementation time and cost! This post is sponsored by AgilQuest. Previous articleYour Workplace, Your Culture: Do You Like What You See? Get Your Hands on a Copy of Our New Print Companion!